Maybe it’s just that I don’t “get” Erikson’s sense of humor or that it wasn’t subtle enough for my tastes, but his Star Trek parody, Willful Child, was a miss for me. In Willful Child, Captain Hadrian Sawback is taking his crew into space for their maiden voyage. Not long after departure, the ship is commandeered by an AI unit named Tammy that sends the ship careening towards their universe’s version of the neutral zone. They’re about to start an intergalactic war and Sawback is the one in charge of stopping it. Unfortunately, he’s not the most honorable person ever put in charge of a starship. To me this book doesn’t offer much. Let’s face it, Star Trek is begging for a good parody and us fans want it badly. Unfortunately, Erikson’s book wasn’t my kind of funny. Sawback is set up to be a misogynistic reckless captain, not unlike our own beloved Kirk could be. The way that Erikson presents it, however, isn’t funny. There’s no subtlety to it. 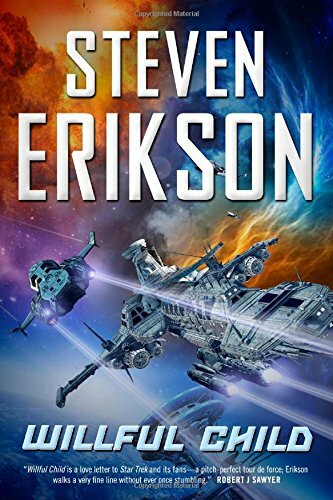 Erikson is open in harassing the women in his crew and there wasn’t a lot to it otherwise. I’m also inclined to find funny names not very funny. Second in command is named “Sin-Dour” and is perhaps the most subtle of the funny names, but there’s not alot in the character that I thought really enhanced that. Overall the characters were a bit dull, I thought. The funniest aspect was the adaptation of the prime directive. The directives the Alliance holds instruct the crew to essentially go forth and conquer. Overall, I wasn’t terribly impressed. Maybe a 2 or 2.5 for me. I received a free copy in exchange for an honest review via Netgalley. This entry was posted in Reviews and tagged Hadrian Sawback, Science Fiction, Star Trek, Steven Erikson, Tammy, Tor, Willful Child.